It’s no secret that TVS has been extensively testing an all-new 125cc scooter. In fact, we know most of its details thanks to spy shots that surfaced online a couple of months ago. Now, however, there’s a new video revealing more details of the upcoming scooter. From the video, we know that the 125cc scooter will feature an all-digital instrument cluster, an external fuel filler cap, an all-new wheel design, LED tail lamps and a chunky exhaust muffler. The video also shows a petal-type disc brake at the front. These were missing from the earlier spy shots and leads us to believe that it could be offered as an optional accessory. The scooter’s design can be termed as edgy and sporty. The front apron, however, looks similar to Honda’s Dio and Grazia. The rear section sports a sharp, swept-back look with dual floating grab rails. The scooter in the video wore 12-inch alloy wheels with a conventional fork at the front. Sadly, the scooter appears to be missing out on LED headlamps. The turn indicators too seem to get traditional bulbs. Given the fact that the Hosur-based two-wheeler manufacturer leads the charge in offering new features in scooters, the omission of LED headlamps is a bit disappointing as the Honda Grazia comes equipped with it. Apart from the Grazia, the new TVS scooter will compete with the Suzuki Access and the upcoming Aprilia SR 125. Currently, the Honda Grazia retails for Rs 62,269 while the Access 125 is priced at Rs 57,744 (both prices, ex-showroom Delhi). 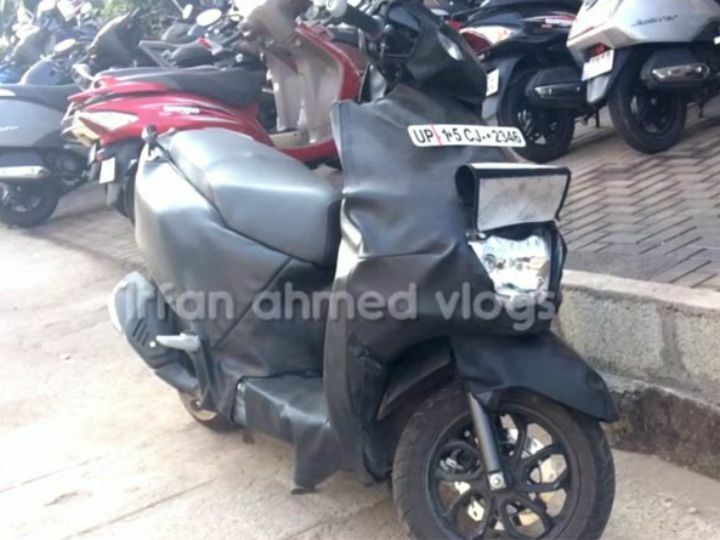 We expect TVS to unveil the new scooter next month at the 2018 Auto Expo. Follow us on our social media platforms to stay updated about all the action that is expected to unfold at TVS’ stall at the 2018 Auto Expo.